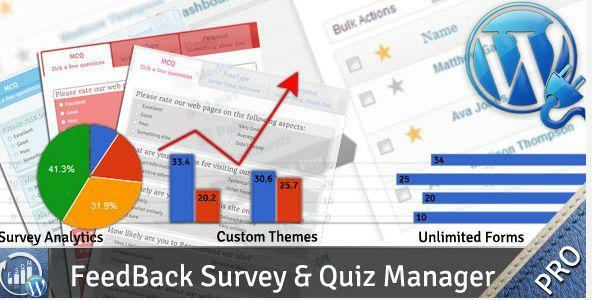 FSQM, is a WordPress plugin which can help you collect Feedbacks, Surveys or host Quizes in your WordPress Blog. Using it, you can create unlimited forms with custom themes and collect user submissions. All user submissions are stored inside the database which you can analyze, edit and/or print. The user can also track/see their submission (obviously if you wish to) through a page. The working of the plugin is very straight forward. You use the New Form from the Feedback Pro menu on your WordPress Dashboard. MCQ or Survey Tab: You can put multiple choice questions with single or multiple selections. You can even add an “Other” option with custom label, which when selected will prompt the user to enter his own freetype answer in a textbox. FreeType or Feedback Tab: Here you can put compulsory or optional questions where users can put their freetype answers. All of the answers can be set to go to one or more specific emails. This becomes handy if you are collecting feedbacks on different topics and have to email different people the answers of different topics. Personal Information Tab: Here we have 4 predefined text fields (First Name, Last Name, Email, Phone Number) which you can enable, disable or even make them optional. You can easily create any extra personal information you wish and can make them compulsory as well. It will start appearing on your submission record. Single or Multiple value MCQ. FreeType text using small input box or large textarea. A Required checkbox with full HTML support. You use the generated shortcode [feedback] inside a page or post (simply paste the shortcode over there). The page will now show your FSQM form. Users submit their answers. A mathematical security check is used to prevent automatic spam bot submissions. Finally you use the View all feedbacks menu to view the submission. You can edit/print the submission as well. Several improvement and new features has been added to version 1.0.3. Please refer to the changelog. – Version 1.0.3 has been uploaded. Please download and upgrade following the instruction. Custom notification email upon submission both for the user and administrator. Admin can receive complete submission data (New in version 1.0.3). Limiting submissions per email address and IP address(New in version 1.0.3). WordPress MultiSite Compatible. You’ll need to buy Extended Licence. Please see the Online Documentation for more information. Recommend PHP Memory Limit: 96M or more. But also should work on 64M depending on number of plugins. Minumum value of 2048 for many suhosin variables. Please refer to our FAQs to learn how to set this up. Share the post "WP Feedback"